Watch their faces light up when you rhyme and listen to their sweet giggles when you read a funny story! 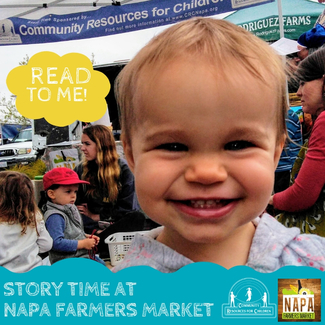 Join the ranks of 100+ other volunteers who have read to children at Story Time at the Napa Farmers Market for the last 17 years. Don't miss this opportunity to share your favorite books and your love of reading with Napa's young children. Sign up today to get your preferred days! NEW THIS YEAR! FIESTA FIRST SATURDAYS! Readers bring their own selections to read (age appropriate for 0-10 years) or select from books provided by the market. Volunteers read to children at the Education Station for 20-30 minutes. If you represent a business or organization, please feel free to bring your business cards, flyers and other marketing material. Community Resources for Children advocates for and promotes quality early learning for children in Napa County. We cannot do this important work without your generous support! Special thanks to the Napa Farmers Market for helping us promote early literacy and school readiness! Frida and Lizette - Bilingual Read Aloud!